What a View! Stretch out and take in the pristine mountains before you. Soak in the sparkling hot tub after adventure. 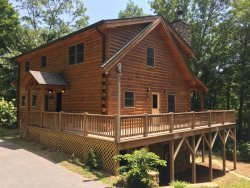 This beautiful mountain top log cabin has an incredible view of the Great Smoky Mountains Hot tub, pool table and loaded with amenities. Relax in the hammock on the porch overlooking the magnigicent view.. Enjoy evenings around the outdoor fire pit. A Bear's Retreat is the perfect setting for your next mountain vacation. 3 Bedrooms & 3 Baths: One king bed on the main floor. Two queen beds. In the loft game room there is a queen sleeper sofa. One set of bunk beds in the alcove that are suitable for small children. This cabin great! Very clean, the team at GSCR is very helpful! The view is amazing. We highly recommend it! Wonderful cabin. Awesome view!! We planned our anniversary trip and ended up bringing the kids and my parents for the Polar Express. Bryson City is so charming. Took many hikes with our 3 year old and thoroughly enjoyed the Hot Tub! We were supposed to be in South Florida this week, but Hurricane Irma had different plans...we couldn't have asked for a more relaxing, fun,peaceful time in this cabin. We dream of owning a mountain home ourselves. The house was simply perfect! We want to comeback for sure! This was our first time in NC and we had the best time! This cabin is beautiful, the view is amazing! The cabin had everything we needed. The sunsets were beyond gorgeous. This was a great experience, we can't wait to come back! What a lovely, well appointed cabin. Thank you - we had a great time and will be back! We had the best week at your beautiful cabin! The views were amazing! We didn't spend to much time cooking so we tried several of the restaurants in town. We rented a boat and and tube twice from Alarka and the prices were great and they were super friendly and helpful. We made sure to to be home in the evenings to see the gorgeous sunsets! Thanks for sharing you wonderful cabin! Our family had the most amazing time at our short stay here. We were so pleased with how beautiful, clean and new everything is here. We felt so at home here. Best cabin stay we have ever had. The sunsets on the porch and the view is unbeatable! Thank you for sharing this beautiful cabin. What a view! This has been the best cabin I've stayed in while visiting Bryson City. The home was spotless and had plenty of space for our family of 6. Would definitely recommend this cabin! BEAUTIFUL cabin, the best we have stayed in during our visits to Bryson City. Thank you for sharing this amazing home. What a view! We've frequently visited Bryson City and this has by far been the best cabin we have ever stayed in. During our stay we tubed down Deep Creek, ate at the Bistro, visited the NOC, gambled at Harrah's and ate at Pasqulino's. All of which was amazing! We hate leaving our favorite town and this beautiful cabin, but we will definitely return. Thank you for sharing this cabin with us. WE can't thank you enough for sharing your amazing cabin with us. We didn't hit the casino but we did slay the Dragon's Tail. We made sure we were back every night to enjoy the most gorgeous sunsets we have ever send. Your cabin is beyond beautiful. The view is absolutely amazing! I am going to recommend your cabin to everyone. There is no comparison. Thank you again. Wonderful Cabin! Had a great time!